The Idaho Legislature passed the controversial bill despite opposition from the state’s university and college presidents. Earlier this year, Boise State President Bob Kustra told KBSX he believes more guns on campus will make students and faculty less safe. But the sponsor of the measure, Sen. Curt McKenzie, disagrees, and points to Utah where guns have been allowed on campus for a decade without incident. 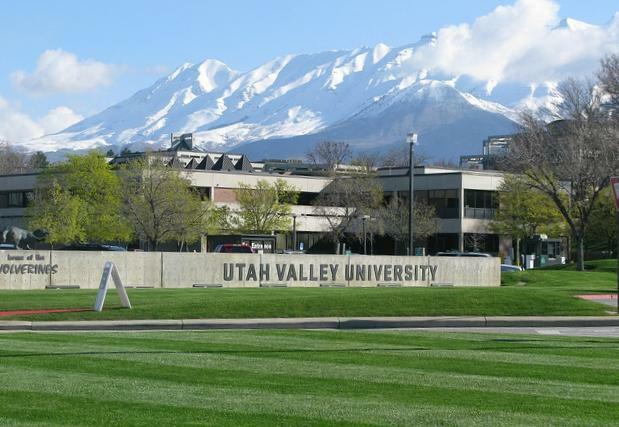 Utah Valley University had 30,880 full and part-time students in 2013. Click "play" to listen to the radio version of this story. At one of Utah’s largest universities, the campus police department is tucked amid practice rooms where music majors trill. Utah Valley University patrol supervisor Justin Sprague is a low-key guy who’s been securing this campus of 30,000 students for two decades. The main safety concern on his campus is thefts. “We also have a drug problem that we’re aware of,” Sprague says. When I ask Sprague when the last time Utah Valley had a shooting on campus was, it takes him a few seconds to recall one close to 20 years ago. It was gang-related, and happened outside a sports venue. But that was long before 2004, when the Utah Legislature made it legal to carry concealed weapons on college campuses. Similar to Idaho, the law was not welcomed by officials at Utah’s eight public universities. But, in 2006, the Utah Supreme Court ruled state schools had to follow the law. College officials braced for a rash of guns firing accidentally in backpacks, students committing suicide, and heated classroom debates turning deadly. “The great, great majority of the U.S. higher education community – college presidents, college law enforcement officers, faculty, staff and students – overwhelmingly agree guns, concealed weapons, do not have any place on college campuses,” says American Association of State Colleges and Universities’ Dan Hurley. Utah State University’s campus police chief says there have been a few calls when someone has accidentally exposed a concealed weapon, but “no problems other than that.” The same is true at Utah Valley University, where school officials referred questions to Sgt. Justin Sprague. Getting a permit in Idaho does require more rigorous testing. Another key difference between the states is that guns are allowed in Utah college arenas, but won’t be in Idaho. Sprague says the presence of guns makes securing concerts and big games a challenge. But the main thing Utah law enforcement did to prepare for campus carry was “educate and train officers about the law.” Sprague notes they’ve learned to be discreet when responding to a call about a weapon on campus, since it’s usually someone with a permit to carry. At first, campus police would address the issue in an open hallway, which tended boost tension and invite public criticism. Now, they handle that differently. “We take them to a more secluded spot, for their own privacy, first of all. And we don’t want to make a big scene,” he says. “You know, our goal is to educate, more than punish somebody. So that’s probably the best advice I could give somebody.” And even those calls are rare, he adds. Utah Valley University seniors John Allred and Cami Cook agree. They don’t notice people, other than police officers, carrying weapons. “I’m sure that people do, but I’ve never seen anyone,” Cook says. On one corner of Curt McKenzie’s desk at the Idaho Capitol sit three candy jars. On the opposite corner - an Army green ammunition box. McKenzie is the Republican state senator from Nampa who introduced a controversial bill that would allow some people to carry guns on Idaho’s college campuses. The bill has passed the Senate and is now in the House.